A couple of weeks back someone from USC's Info Lab contacted me to tell me about his project to track moving objects and uses Google Earth to visualize the tracking. The significant part of his project is to do near-real-time queries of the nearest moving object to another location. Apparently the bus trams near USC have location trackers (they are not as active during night hours, so wait until after 6 AM Pacific Time). Load up the network link to see this in action. Make sure the "Trams" network link is turned on to see if the buses are in motion. 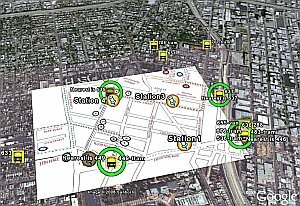 The green circles you will see represent the trams that are closest to the 4 stations at the time the query was made to the database. 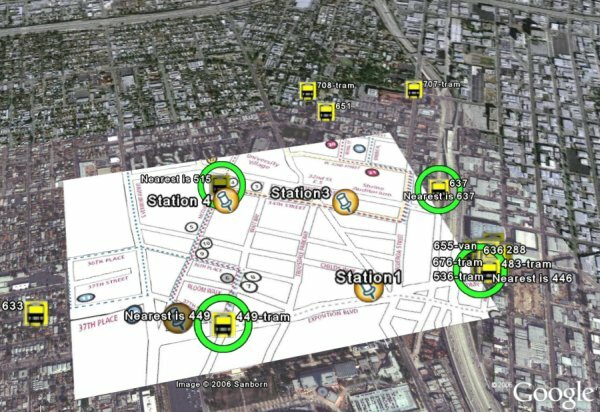 You can turn off the "Tram Map" so you can see the excellent aerial photos of the USC campus while the buses are moving around. Thanks for contacting me Jeff, this looks like a fun project! There are a number of other cool looking "GEO" projects being done at USC, check out the list here. would be nice to know more about the tech background of this project. what infrastructure is necessary to get this done??? That's great technology but i don't live near USC, so what's in it for me?